The Schlagwerk Circle Drum is a great sounding, easy to play frame drum with a natural skin head. Because of the light-weight construction: Ø 50 cm = 700 g, Ø 45 cm = 600 g, Ø 40 cm = 500 g, Ø 35 cm = 300 g it‘s especially good for use in Drum Circles or playing for a long time with one hand! The multiply Beechwood frame is covered with a tensioned, sturdy goat skin. The crossed belts help maintain light and sure handling. A set of the popular Circle Drums – the drums are in tune with each other, creating an all around package for a small group. Several basic packages can be evenly distributed as a class set. 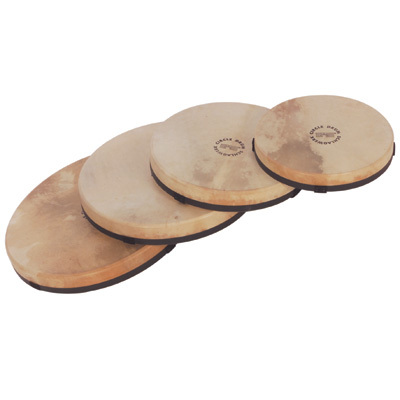 This set of 4 Circle Drums contains one each of the following: 4 Drum Mallets, Circle Drums Ø 35, 40, 45 and 50 cm.